“Red sky in the morning, sailor take warning” must surely have been penned by someone who looked on the same redness in the rising sun as I saw this morning. I can only imagine what must have followed that red sky for him but I am intimately acquainted with what followed my RED SKY IN THE MORNING. The fog ate the icebergs around me one by one before seizing hold of the whole world as I knew it. The wind veers to the northwest and seems to spew the fog from a nozzle. The red of the morning is gone. The horizon is gone. Even the line between air and water fails to be discernable. This is no tall tell and I’ll not say “couldn’t see the bow”. The CAP’N LEM is only 31′ long. 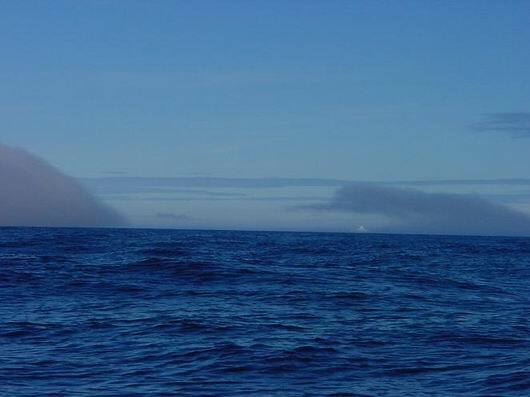 I could see the bow and perhaps one more boat length into the gray white mist over gray blue water. As the cream dissolves into the coffee so the fog dissolved into the water. My little radar flashes its warning HD-SIG-MISS on the screen and is useless. I leave it on anyway. I become obsessive with staring into the fog only allowing a glance at the plotter now and them. I break away long enough to take in the headsail to slow my progress even farther. Then back to the stare. It takes me 35 minutes to open and warm a can of chili for breakfast. (Get the can, go back and stare, get the can opener, go back and stare, get pan, go back and …) My minds eye sees over and over the 200′ wall of ice from last night’s nightmare. How long do I stare in to the nothingness before I see something move in the water off to port? 20 minutes, 40? A bergy bit wallowing in the swell. For a moment I’m relieved to know just how far I can see. Perhaps 50 yards, more or less. It passes on into the fog and once again I lose all perspective, but there are more. My speed over the ground, 1.6 kts, mostly from the little engine at idle ahead, ready to help if I need to turn quickly. It would help me stop to if I slam it into reverse. Still I only creep. The wind is in the fog and I pick up speed with the mainsail along and I don’t like it but I just keep staring into the white of it all. 2.5, 3.2, way too fast for comfort. Vision is based on contrast, here there is no contrast beyond the lines of the vessel and a few wavelets on the water close aboard. I jump at shadows. A cold tingle races up my spine. You know the kind, like someone just told you a ghost story that you believe. The fog is thick horizontally but thin vertically. There are clouds overhead and a cold hazy sun moves in and out. The shadow I see this time is the sail on the silver screen of the fog. The next shadow is a berg, big but not especially so. I’m relieved to see it. At least I know where this one is and it’s off the port. I steer around and look for the next one. 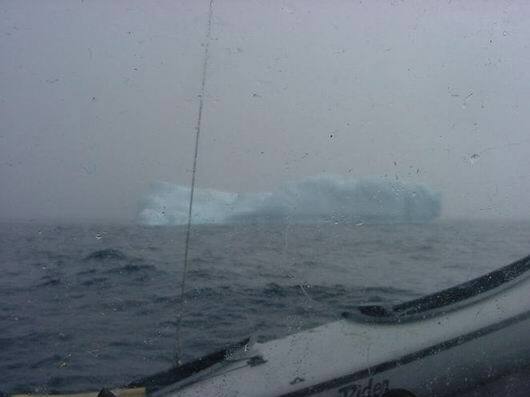 By noon, I’ve encountered 5 bergs in this manner. By noon my nerves are shot. By 1300 the fog lifts long enough to show me a clear path…south. Quickly, I e-mail Ken. I’m done, I tell him. I admit to Ken, myself, God and the whole world. I’m done, I can’t do this. Then, the fog closes in for more. My one mile trip has now become my 100 yard trip. My thoughts are, just make the next 100 yards toward the clear pathway you were shown. That’s all that is important now. The next 100 feet. 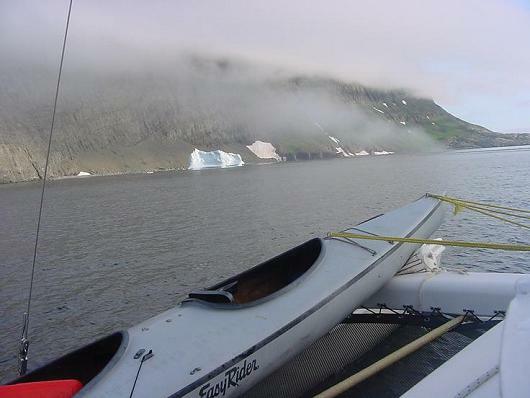 The fog doesn’t lift for another 3 hours and I see the sea ice, bergy bits and ice bergs I’ve navigated through. And that was just the beginning! I’ve come to the doorway of the Northwest Passage and not even made it up the steps. Doesn’t matter, it has given me my White Dawn adventure, and I’m sick of it! Let the Sons of Norway* made their historic voyage. It’s fitting. Let them prove the Corsair -31 a proper vessel for the Northwest Passage. I have nothing to prove. Not to myself or to anyone. After hours of staring into the unknown I see the fate of Franklin, the misery of Amundsen, the disappointment of those who tried and failed and those that tried and died. I’ve seen enough ice to last a lifetime. It was a beautiful dream to sail the Northwest Passage and now it is a beautiful reality to turn my back on it and head toward other adventures. If we’ve learned anything at all, it is this: The journey and not the destination is the adventure. The destination was just a wonderful excuse. Let’s go to Labrador and look for white bear! Red sky in the morning, sailor take warning! Then the sun rose the likes I have never seen in its redness and eeriness. Morning chores. No sleeping now, though I can hardly hold my eyes open, I remember and photo the 0800 position. By 0810 the fog hits. 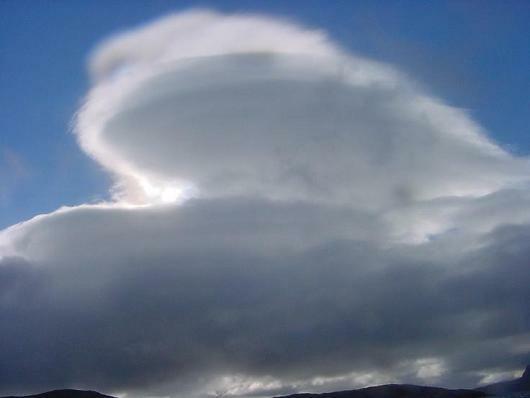 Labrador is no more to be seen over the stern of the CAP’N LEM. I can only glimpse now and again the vague outline of Resolution Island to the west of me. It’s been a slow crossing of the Hudson Strait and that’s just fine by me. Now the sun is up though hidden in grey stratus clouds and with it the wind picks up to a respectable 10 kts from the south west. The forecast call for south to south west at 15 throughout the day. Sunday is good to me. I can settle into my at sea routine. Check position, check horizon, and check the lines and sails. Make my coffee, watch the sea go by, make my bed, watch the sea go by, shave and brush my teeth, watch the birds fly by. All the while knowing time is motion, time moves the boat and boat moves me. I do not know when or where I will pull in next. The settlements on southern Baffin Island are up the fjords and would require backtracking to make any more headway north. I hate backtracking! 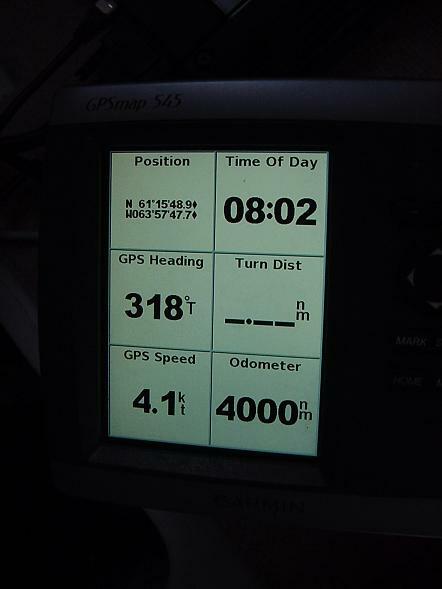 At 0801 local time, (-3) on this day August 1, 2010 in position 61° 15′ 48.9″ N ~ W 063° 57′ 47.7′ W the odometer on the Garman GPSmap 545 turned 4000 nautical miles for Two Harbors Minnesota since April 6th, 2009. I still can’t bring myself to figure the miles left to go. The adventure is open ended and will direct itself. Many factors beyond my prediction and of course beyond my control will come to play in that final figure. I’m quickly rewarded with …fog. An hour later, it’s gone. I test the seawater temperature. 40.2° F. The air temperature is 49.0° F. I expected it to be lower. I’m learning to only expect the unexpected. Oh mud! Sticky stinky mucky mud! But did not let me go. over northwestern waters will subside tonight as the low recedes. North Labrador Coast and the Northwest Labrador Sea. Leaving the dangers of the sea for the safety of the harbor is to leave the safety of the sea for the dangers of the harbor. The window of opportunity to transit into safe harbor is always small filled with its own peril. Here, the closer to land the more icebergs, the more icebergs the more bergybits. This gale is from the wrong direction and direction not strength makes it even more ominous. The CAP’N LEM jibs and we head in for the fjords through rocks and shoals awash in the surf. But there is a clear path if taken one turn at a time. On this heading I cross the 60th parallel. My south most latitude was some 1080 nautical miles below me now and many more miles with all the crooks and turns of river and lakes, cove and coastline navigation added in. Still, I maintain the trip is only one mile long; the mile in front of me. The mile in front of me is dark with the landing sun and gray with fog. My little radar chooses this time to lose its heading signal, a critical component in painting the truth on the screen. I have to settle for the lie and deduce the truth from that. As the sweep goes round the echo is smeared 360 degrees on the screen. So the little Furuno* even now tries to tell me something. It says, “Something is out there, something big, I won’t tell you which direction but I will tell you how far, now work for it.” So I work for it. If it closes fast it’s ahead, if it holds steady it’s abeam, if it opens it’s astern. I can live with that, for now. At a quarter mile I see it. Big, whiter than the fog, greener than the sea, it’s an iceberg. Now I know. I can sea a quarter mile into the fog. I press on into the fog and repeat the process comparing the GPS to the smears on the radar to the chart plotter and thread my way to anchorage at lat 60° 04′ 56″ N ~ long 064° 23′ 41″ W in 45′ of water. The bear I saw among the shore rocks resents my intrusion and ambles off, yes, over the mountain. I wonder if he may be back in the night, so I decide on a cold cereal supper. The sun rises at 0451 and with it, as I have come to expect, the wind. 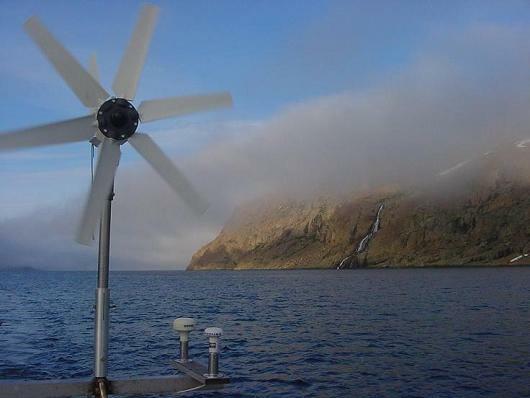 This wind is not the slow stead rise of the world warming up. No this is the freight train wind of a frontal passage. The clouds are ragged, the wind gusty, the harbor choppy. I start my morning routine with a weather eye for trouble. Then I know. I know that I know even though I can’t remember how I know. Two seconds later the anchor alarm on the GPS confirms it. We’re dragging. I’m sitting on the can and we’re dragging anchor. No time for pleasantries. Up with the longjons and out the door. This is not good. We’re moving fast onto a rocky lee shore. The anchor is not even attempting to grab. At the hatchway I grab the safety line, quick around my waste, a long tailed rolling hitch and a jerk to snug it close. First things First, always. I deal with pants later but not much later for this is a northwest wind and it bites. Come to life oh little Honda or all it lost! Yes! First try, just as it has thousands of times, it’s alive. Careful now, seconds count but I can not, must not miss a step. Check the engine, is it peeing? Yes, the little stream of cold clear water is shooting from its port to indicate all is well with the cooling system. Check the anchor line, where is it? I consider trying to back away into the wind lest I foul the propeller with the anchor line. Wind too strong. I risk it and power forward slowly increasing speed until just barely creeping ahead, quick back below, dawn rain pants over my longjons, the only thing I can get on without taking off my shoes. Extra sweater, rain jacket and watch cap. Check myself, I warm from exertion, cold from the wind, but OK. Hypothermia can kill as quickly as any bear. My old adage rings in my ear, “It’s easier to stay warm than get warm”. CAP’N LEM is moving into the wind and the anchor line is streaming aft now. I stop the prop, go forward and haul in anchor line, lay it on deck, go back, push forward with the engine, taking great care of where the anchor line is. Foul the prop… game over, rocks win, Tommy loses. Wind increasing to steady 30 kts. I push into it and repeat the anchor process, only now at short stay the anchor is heavy, damn heavy. 2-6, 2-6 is repeated out loud and gains only inches. Back to the tiller, off auto steer and drag the anchor myself in the opposite direction. Check the chart. Head for deep water. Moving 1 knot, but its moving and getting me blessed searoom. When my daughter chose a life at sea and first earned the privilege to stand the conning watch on large vessels my only fatherly advice to her: “Searoom, Searoom, searoom buys you time, time buys you safety. Time, Time, time buys you searoom. Searoom buys you safety!” Well, that wasn’t my only advice In fact, it only opened a flood gate of advice, but that’s what fathers do best, give advice. The depth sounder shows a rising bottom. Now what? I press on. Surely the anchor will catch on that and I’ll be back to hauling and … but no, we slide past the shoaling with 9 feet under the keel to spare and move into deeper water in a long slow chug. I start the coffee water. 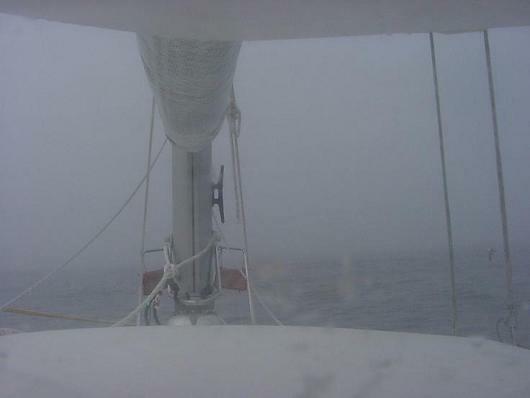 By the time its hot I’m in 90′ of water and the anchor hangs straight down when I stop to drift in the fast blowing wind. 2-6, two inches, 2-6, three inches make off the slack I’ve gained and repeat. Now there is a lot of line on deck. Line in a heap is a sleeping snake. 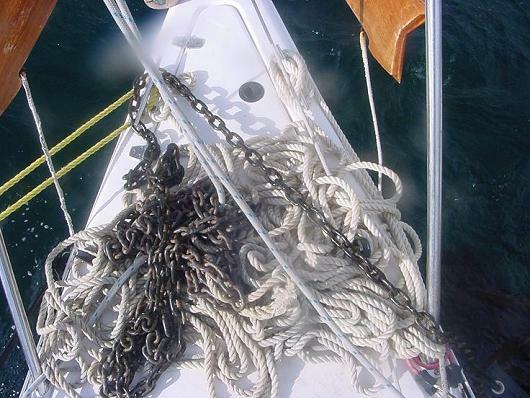 Don’t let the anchor run; take the time to make it off as it comes up. If it runs the snake comes alive and can grab a hand, a foot. I go back to reposition in the deep water, rest, make a cup of coffee. I can do that now, even though the job is not finished. I have Searoom. I’ve angled out of the bay so that if anything goes awry I’ll have my searoom and more time. 2-6, 2-6 and now it’s chain. 2-6, 2-6 and the true sea monster bent on destruction is hauled to the surface. Bull Kelp. Kelp, that leaf by slimy leaf, stalk by slimy stalk wrapped it self around the anchor chocking its flukes until they could no longer bite the muddy bottom and gave up and let go. I don’t spend a lot of time thinking about the “what could have happened” though I do think about it. I just acknowledge the danger and resolve to take care. The kelp was an unknown. It wasn’t on the surface or marked on the chart. It was just an unknown factor to be dealt with. One of my all time favorite quotes goes like this: “Tall tales of narrow escapes from death at sea are a sure sign of poor seamanship.”** My aim here is not to spin a tall yarn of my prowess as an escape artist but reveal to you my poor seamanship as well as my good. I had much rather avoided this morning and I hope it never happens again, yet I know the only way for that is to stay home. I’m not ready to stay home. I am in a land and sea unknown to me. It is filled full of the ‘unknown’ and the ‘unknowable’. I have the best equipment available to me for the job at hand that space would allow. The success of each day will rest only with my choices in handling the unforeseen things the sea and wind send my way. Because I’ve invited you along on my grand adventure, my shipmate, it is of the utmost importance that I tell you just what happens, what the unknowns are, when they become known and how I reacted to them and what the results were. 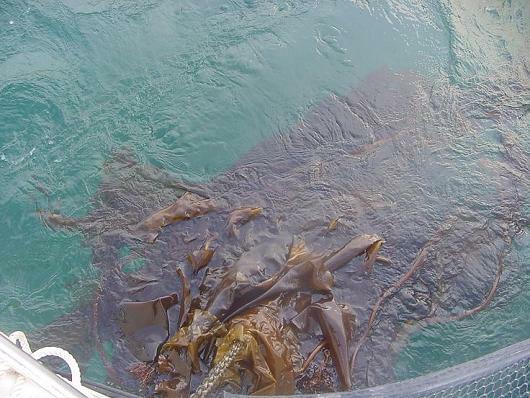 The anchor is cleared of kelp with the boat hook, brought on deck and stowed as though nothing had happened. I return to the cockpit and adjust the course deeper into the fjord, finish some jobs started before the rude interruption and return outside marveling a beauty of the land, the sea and the storm. Another cup of coffee, drank slowly this time, with peanut butter on a cracker and I find new anchorage in Williams Harbour at lat. 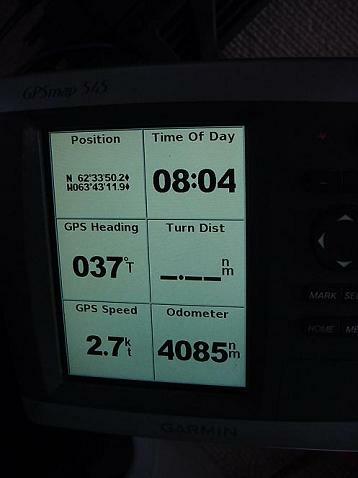 60° 00′ 16″ N ~ 064° 15′ 59″ W in 35′ of water, wind at 25 kts from the west. The anchor is holding. I check it often. I check the shoreline for bears…often. *This little wonder has served me well first aboard AVANTI and now aboard the CAP’N LEM. My remarks are not to be taken as a slam against this model or Furuno. In my estimation, Furuno makes some great equipment. This unit has performed for 9 years without fail until now. Job well done! ** Once again, may not have quoted exactly and can not give accurate credit. If someone does know the quote and who made it please let me know. I can only recall its impression on my seagoing life. There is no rest sailing into the night in high latitudes. Only a moment or two of catnap before the overwhelming urge to look overtakes me and I’m up peering into the darkness. It’s a different darkness, to my relief. It’s not the stark blackness of so many mid-watches I’ve spent staring into out the bridge windows of so many ships. Tonight there is a full moon and the near arctic twilight that will last all night. I search the horizon for ice bergs. Ice bergs I can avoid, but they give birth to bergy bits, hard, old and very low in the water. I avoid the icebergs to avoid their progeny. The wind is building from the south and I’m sailing 3 kts faster than I would like even with the headsail only a handkerchief and the mainsail at half mast. Worry about other vessels is the last thing on my mind but I look for them anyway. I look and look and look and when I can’t stand looking any longer, slip below, reset the alarm for 15 minutes and close my eyes. The process is repeated until the sun reveals the secrets of the sea and I can close my eyes for 30 minutes. But with the rising sun comes the rising wind, 20 kts and higher in gust. Oh, but it’s from the South! By afternoon the seas are bent on proving the CAP’N LEM a better boat than I am sailor. I concede. First, we surf down the face of the wave but still it overtakes us and lifts the vessel to the crest, breaks around her, then stalls her on the back side to set her up for the next. 6 kts to 10 kts to 5 kts, 5 kts to 7 kts to 4 kts to 7 kts to 3.5 kts, the GPS is too accurate to give me true speed as we slip forward and slide back. I watch the position and figure the mile made against the time it took and it appears we are making 5.5 over the ground. 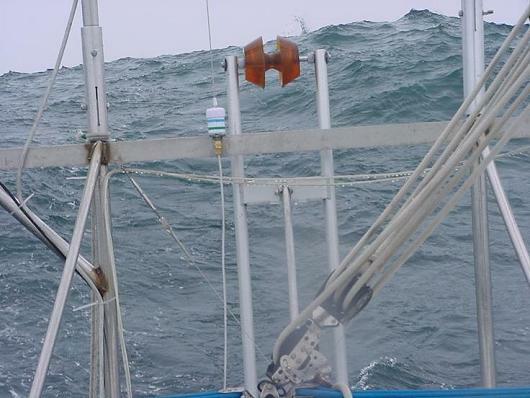 That’s good with such small amount of sail presented to the wind. Long ago I was privileged to read an original letter by Joseph Conrad on display at the Seaman’s Church Institute located in Lower Manhattan. In the letter Joseph Conrad wrote to a friend, “Any man can shorten sail after the gale starts to blow, but the master mariner shortens sail before!” (May not be the exact words but you get the point) I may never be known as a true Master Mariner, licenses be damned. I don’t care, I only wish to be remembered as a Cautious Mariner! For a long time we make a lot of miles but there are currents to be dealt with on the north coast of Labrador and what had helped us in the morning now slowed us and stack the waves into 15′ mountains. (Mountains being a relative term to the size of vessel one finds themselves in). Still the CAP’N preformed admirably and the little auto pilot is a “Guitar Hero” never missing a lick these long sea-miles. I think about the waves to come. Not the ones coming behind us, no, they just need to be accepted each in its turn. Its tomorrow’s waves! There is a gale coming. And coming from the wrong direction. I cry “Uncle” and start the search for an anchorage. I think I found one only 17 miles away in the fog… through lots of rocks and shoals…in bear country. Perfect! Came into secure harbor and was greeted, you guessed it, by a bear. He was on shore. After sleepless night more worried about building gale than bears, he wondered off but will probable be back in the night. I’m not cooking anything tonight! May leave motor running as deterrent and letting halyards slap. I crossed the 60th at 1900. Will blog tomorrow. 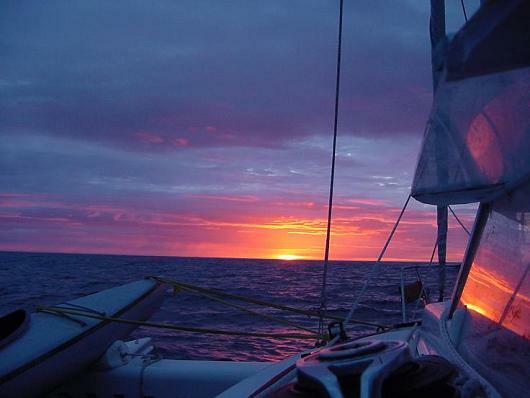 Sailing into the night with south wind at about 12kts. Short main only and am thinking about shortening even more. I don’t want to make more than a couple of knots. Bergy Bits a sea, bears ashore. What’s a sailorboy to do? Dawn is early in high latitudes in the summer time. It’s a long haul lifting the anchor 70 feet from the bottom to the deck. 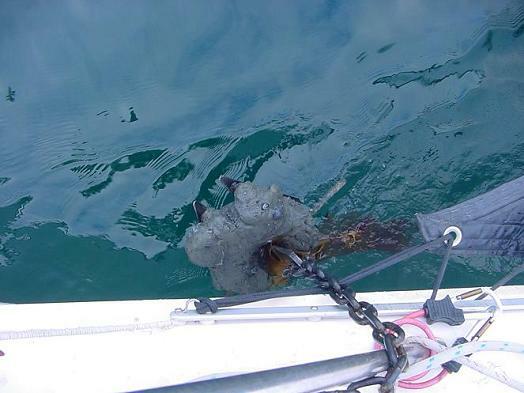 The bear only a few hours earlier puts a little more urgency into my 2-6-heave of the anchor. That done, I retrace my course back to the south end of the Tickle. This time there is calm on the face of the water brought on by a heavy, damp, soupy fog. It wasn’t the strong wind that sailors of old feared most. No that can be dealt with, a reef, a manning of the pumps, hove to if need be. No, it was the fog. The fog gave strange magnetism to rocks and shoals, even other ships. How else can it be explained when two ships would cross thousands of miles of ocean only to try to occupy the same small 100 feet of ocean real estate at the same time to the death of both and all it the fog. Bad things happen in the fog. But things have changed for a sailor like me and I welcome that change. I could not and would not attempt a journey like this in another age. I’m no Amundsen or Shackleton. I’ll take my radar, depth sounder, auto pilot, and GPS, thank you very much. As I’ve said from the beginning, I’m no stuntman. I’m just an old guy living the dreams of his childhood on oceans of the world. 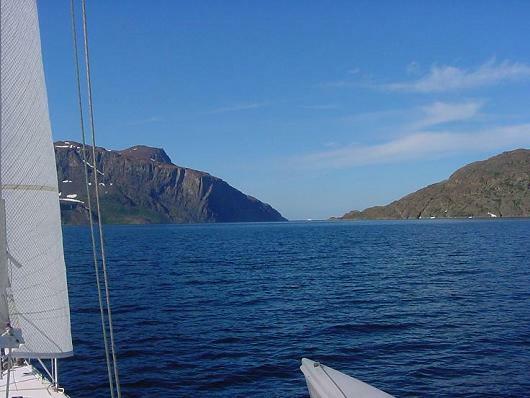 Since I first heard its name, sailing through the Mugford Tickle has been one of those dreams. Having peered into the Tickle in the clear sunshine of yesterday, I’m free to enjoy the intimacy with this wild and wonderful passage that comes with the closeness of the fog. At three knots, there is no hurry. 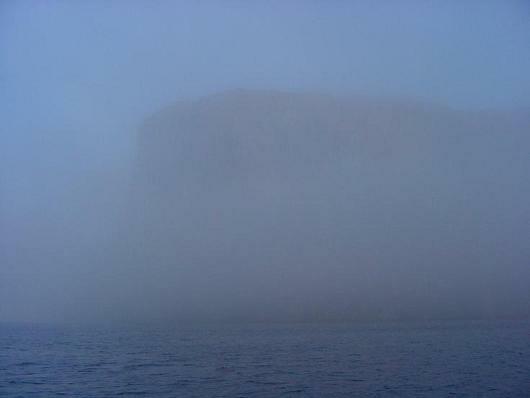 The high fog comes in billows giving glimpses of the massive cliffs towering over the channel before closing in again. My imagination loves the fog and runs wild. I think, as Moses parted the sea and walked on the dry bottom surely some ancient Inuit Shaman of great power came to this rock and struck it with the paddle of his kayak and parted the land to pass through on the seawater. I strain looking into gray of it seeing nothing after a boat length but mist. The truth is the only weapon in the fight to overcome the overactive imagination in the fog. And the truth is found in the compass, the sweep of the radar and the glow of the plotter. I know where I am. I trust my instruments. Still, the imagination makes a ship’s bow out of a shadow, and I check the radar yet one more time. When I’m more than half way through and the Tickle seems satisfied it can’t scare me back again, it begins to lift the cold gray skirt to reveal the spectacular. Water falls everywhere. A grounded iceberg at the north end is waiting its turn to transit the Tickle, waiting for the warmer seawater to shorten its keel. Time means nothing to ice waiting to be water again. Icebergs are relentless waiters. I feel as though I’ve sailed through Middle Earth with Frodo and Samwise. The morning breeze catches the sails just abaft the beam and the Mugford Tickle slides slowly to the south, for the CAP’N LEM want to go north. I cautiously approach the largest iceberg yet. There are seal sunning themselves on an ice shelf the waves have washed around the grounded berg. I just couldn’t bring myself to come any closer for a photo-op. On to the Mugford. Even the wind, as light as it is, seems to want me to sail the Tickle. It pushes the CAP’N LEM on toward the massive cliffs of Table Mountain on the southern end of the Island. Labrador has some of the world’s oldest rocks. They must have found them on Mugford. I’ve never seen the likes. They look old, they feel old, they demand reverence. I enter the south end of the Tickle making only 2 knots. A mile into channel and the wind dies completely but only for a moment. North through the cut I see it coming, wind and lots of it, squeezed by the cliffs it’s in a hurry. I turn the CAP around and ride it out much faster than I came in. No use fighting that. 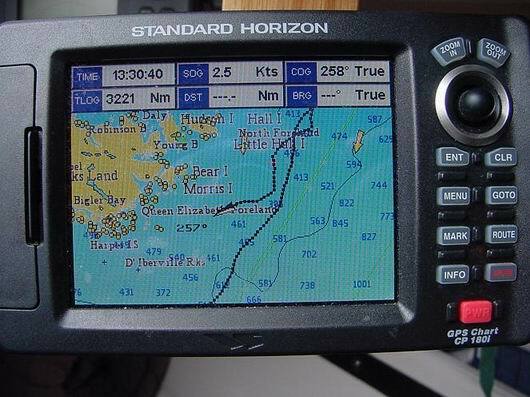 East of the south entrance is marked anchorage on my electronic chart. I head there. It’s deep for anchoring so small a boat but I have plenty of line. It’s the pulling it up that’s tough, 69 feet of hauling the anchor and chain remind me why I went the gym all winter. With the anchor down, I set the alarm for 0400 to get an early start. I won’t make it to the alarm. It was in the night the white bear came. When I was captain of the SHEARWATER, I trained myself to wake up quickly, completely and pleasantly. Some captains seem to pride themselves on grouchiness especially when being woken up in the night. I wanted to avoid such a reputation, never wanting my crew to hesitate to call me for even the most trivial mater they thought I should want to know about. Most times, I was awake when the knock came on the door or the phone rang. The slightest change in engine RPM would suffice to call me into consciousness. So it is on the CAP’N LEM. At anchor a wind change, a change in the rattle of halyards, sometime just the passage of an hour without looking at the position is enough to wake me. This time it was a bump and a shove. I awoke with a “that’s odd?” kind of feeling. I first checked the position. In the swing circle. Listen for wind. There is none. But there is something, a heavy breathing sound! To the ladder I pull back the Curtin I use to help hold in the warmth of the fireplace. Outside, an orange moon is setting in the southwest as long sub arctic summer twilight illuminates the landscape in an eerie predawn looming. Then from between the port hull and amma he swims leisurely looking back at me straight in the eye. He had been sizing up this strange bit of flotsam. ‘Its white, like ice, but it’s not ice, way too warm,’ he must have thought when he gave it a push. ‘And what’s that delicious smell? Could it be…Why, I think it is… Caribou bologna from Uncle Sam’s Butcher Shop in Goose Bay. Maybe I should just come aboard and see if any ‘s left from supper.’ And then, ‘Look at the ugly seal that just poked his head out the strange ice hole!’ One can only guess at the thoughts a white bear must have when encountering such a small little ship so alone at Mugford Island. Well, whatever his thoughts, mine were different! No way am I prepared for an encounter with a polar bear at 0300 in the morning. Down I go. Polar Bears pull seals 4 times bigger than me out of little holes in the ice 4 times smaller than the hatch of the CAP’N LEM. I grab the first thing I can lay my hands on. My sauce pan. I bang it against the tea kettle. Not very lethal weapons, true, but effective. I bang the pan on the hull for good measure. I don’t want to even see which way this guy goes. No, this surprise encounter will do me fine for a first time. I don’t even go for another look until the dawn has broke and light is all around. They told me where you see seals, you’ll see bears. You are currently browsing the archives for the Labrador Coast category.